What is the Active Transportation Advisory Committee? 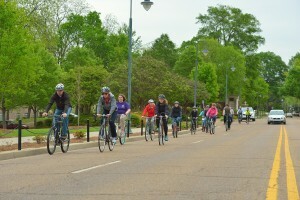 The University of Mississippi Active Transportation Advisory Committee (ATAC) exists to plan and support alternative transportation initiatives at Ole Miss. The committee will work to foster a culture of safe biking at the University through supporting improvements in the realms of engineering, education, encouragement, enforcement, and evaluation and planning. The Active Transportation Advisory Committee will also be responsible for keeping the Bicycle Friendly University application current; advise relevant department on issues related to and affected by bikes and bicyclists on campus; and review policies, programs, and procedures related to and that will affect bikes and bicyclists.